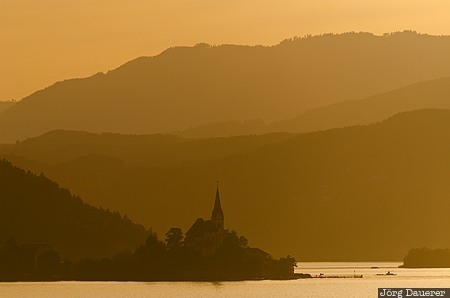 The silhouette of the church of Maria Wörth (St. Primus und Felician Parish Church) on a peninsula at the lake Wörthersee surrounded by the mountains of the Austrian Alps backlit by the setting sun. Maria Wörth is in Carinthia (Kärnten), Austria. This photo was taken in the evening of a sunny day in May of 2012. This photo is in the Photo Calendar "Alps". This photo was taken with a digital camera.